Because we strive to bring you games by publishers you don’t normally see on the shelves of your local retailers, one of the cool things we get to do is watch as a company grows from their first issue to working on an expanded line of games. The vast majority of the time a company stays with what it knows best. 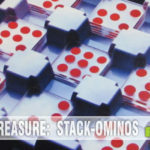 Green Couch Games focuses on card games, while Genius Games is all about games with accurate science principles. 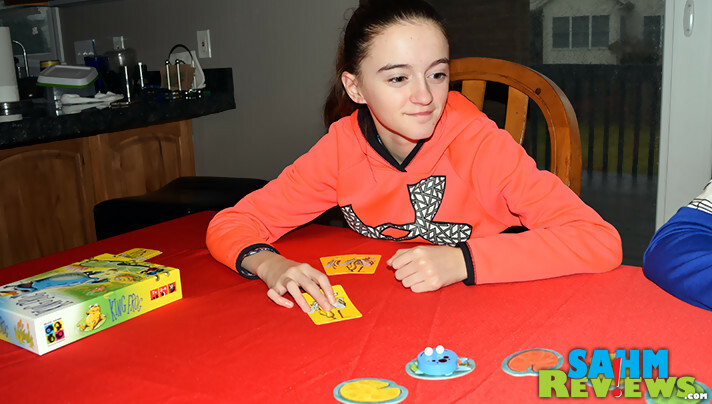 One company we featured last February was Brain Games Publishing and their first foray into the world of board games, Ice Cool. To say they “hit it out of the park” with this ice-themed dexterity game would be an understatement. 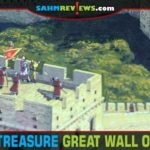 Not only did it prove to be popular with hobby board game enthusiasts, it can now be found on retail shelves at Barnes & Noble and won the prestigious Kinderspiel des Jahres award (Children’s Game of the Year)! What would they do as a follow-up title? You’d expect it to be another dexterity game or even an expansion to Ice Cool. And you’d be wrong. 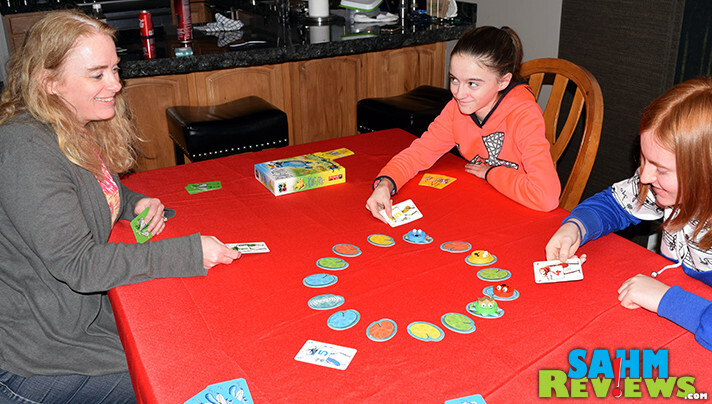 Instead, Brain Games came out with King Frog, a card-based game about frogs and their Royal Frog Race around the pond! About the only similarity to Ice Cool is the targeted age range of 7+. But as we mentioned in our original Ice Cool article, don’t let that fool you. 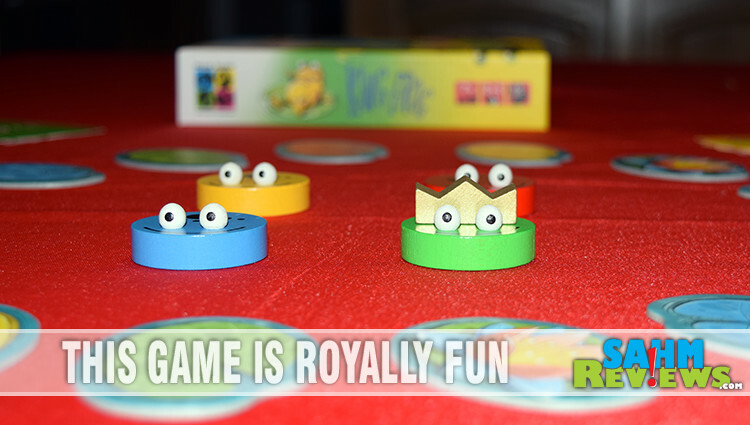 King Frog is fun for anyone, even those much older than seven! 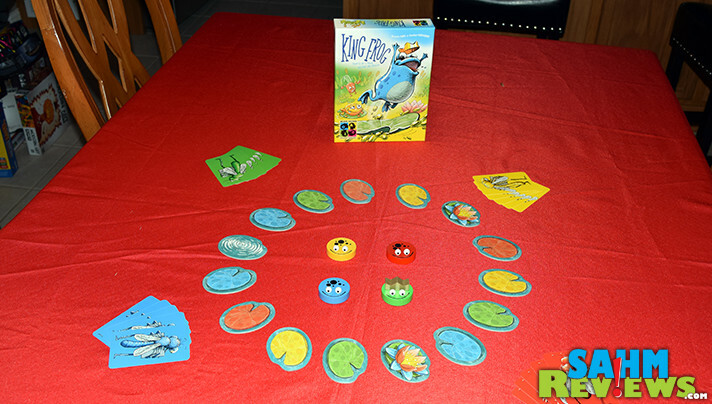 King Frog is designed for 2-4 players, but we really suggest playing with the full complement of four. There are special rules for playing with less that take a little away from the game, so stick with four. Included in the box you’ll find a total of fifteen tiles, 20 mosquito cards numbered 1 through 5, a crown and four adorable wooden frogs. 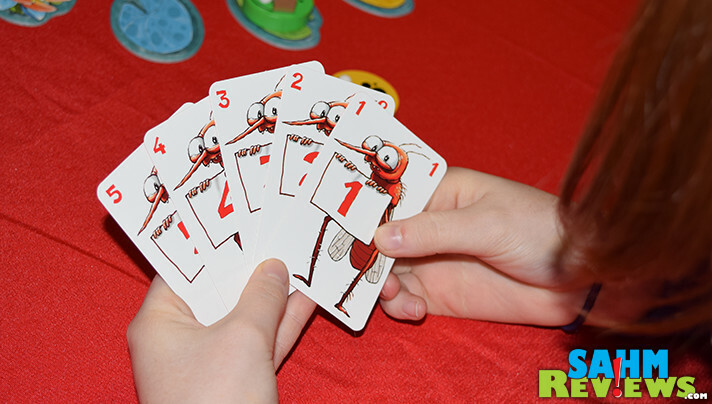 Each player picks one of the frogs and the five mosquito cards of the same color. The lily tiles are set out in a circle, evenly spaced and including the three special tiles. The youngest player places their frog on any lily pad they like, and everyone else then places their frog either directly in front or behind this growing group. The front-most frog receives the crown to begin. Working from a hand of five cards, everyone chooses one of their mosquito cards to play, revealing them simultaneously. Starting with the lowest-numbered revealed card, that person’s frog is moved clockwise an equal number of spaces. Only one frog can be on a lily pad at a time, so if they would land on an occupied space, they hop over to the next open pad. If more than one player is tied for lowest card, the frog furthest back in line hops first. Once all frogs have moved, check which frog is in the lead and give it the crown. If a frog landed on a water lily of their own color (or a wild), the mosquito card they played is returned to them. Otherwise that card is lost and removed from the game. If you run out of cards to play, you lose the game and your frog is removed from the race while the rest of the players continue. There are three ways in which a game of King Frog can end. First, if you are the last frog standing, you win immediately. If the last two frogs leave the game at the same time by running out of cards, the player whose frog has the crown at that moment is the winner. 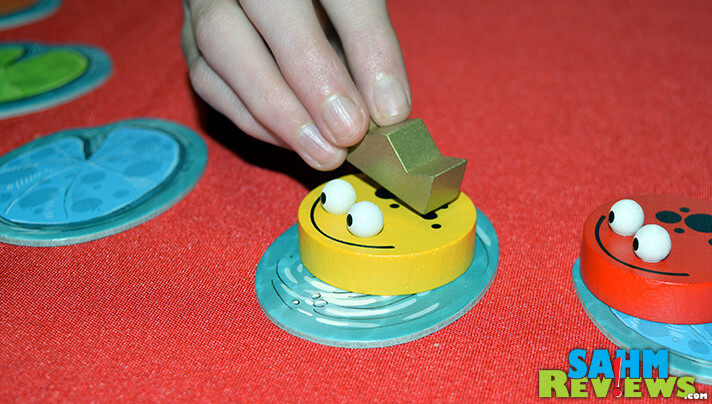 At any time if the lead frog laps the last frog in line, the game ends immediately and that player (owning the lead frog) wins King Frog. 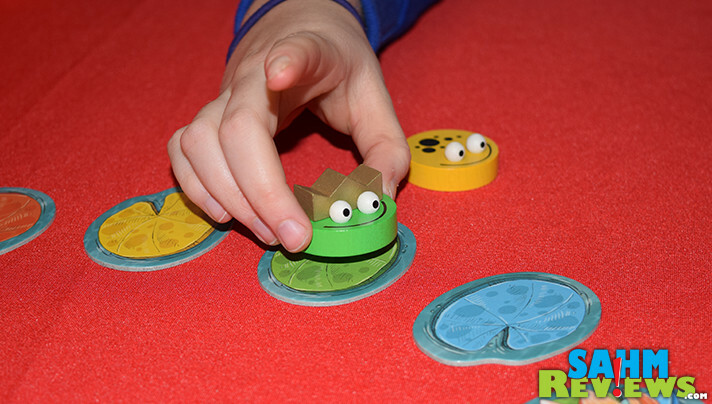 Obviously, King Frog is nothing like Brain Games’ previous submission, Ice Cool. But it is much easier to set up and teach, and requires a lot more forward-thinking and planning than their previous title. At under $20 on Amazon, it’s a solid choice for someone who enjoys games with a little bit of planning and strategy. Keep in mind though, it is best with four players. 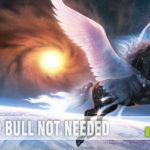 What is Brain Games Publishing working on next? Follow them on Facebook and Twitter to find out! I personally love games with planning and strategy! My husband not so much. But I think we could still enjoy it! 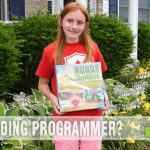 I like games that are easy to learn but challenge your planning and forward thinking skills. I bet I would enjoy this one. I love playing games with my grandchildren. I will check this one out. It will make for good fun when they are home from school for snow days. I’ve never heard of this game before. Looks like something my nephews would enjoy. My son is 8 and finally old enough to get brain games. Love to have game nights and always looking for new games to add in. I love card games and this particular title seems fun for the entire family. Those tiny crowns add a touch of cute too! Sounds like such a fun game! I am always looking for new games especially for us to take the Cabin. This would be perfect and our son turns 7 in August. Maybe Ill try to track it down for his birthday. This looks like a lot of fun. We like strategy games that don’t take too long to figure out how to play. I’m a few years from needing this kind of game, but I’ll keep it in mind!